Finkbuilt » Blog Archive » Is This a Meteorite? Note: This thing is a spec of dust – maybe 200 microns in diameter. I‘m a little bit embarrassed about the last time I asked, but it’s different this time, really. You see, just becuase you’re not awakened at night by a crashing sound, then wander into the living room to find a smoking crater in the floor and a hole in your ceiling that you could drop a refrigeratior through, doesn’t mean that a meteorite didn’t land on your house. My son and I set up a micrometeorite collection rig in the back yard as a school science project, and while we were waitng for the space dust to fall into our trap, I ran a magnet along the inside of our house’s rain gutter – I read that this was a good way to find metallic micrometeorites. Quite a few particles stuck to the magnet. This one looked the most like a meteorite to me. 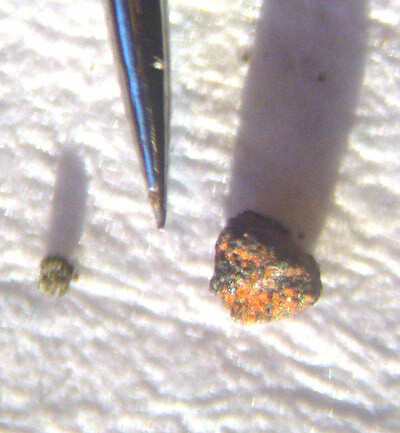 To get a sense of scale, the pointy thing in the picture is the tip of a small sewing needle, and the white surface is #2o bond. What do YOU think, micrometeorite, or not ? This entry was posted on Tuesday, May 29th, 2007 at 8:04 pm	and is filed under Debris. You can follow any responses to this entry through the RSS 2.0 feed. Both comments and pings are currently closed. Yep. And those splotches are undoubtedly the Andromeda Strain. A bunch of really stern and singleminded people in shiny plastic suits will be knocking on your door shortly. Really cool post. Let us know what the collection station turns up. Glad to see you’re still stopping by. Sorry I never followed up on that shirt post. I haven’t made it yet. But yes, I’ve not missed one of your posts since I found you with the “how to make a ring with a coin and a spoon” post. I just don’t comment that often. Did you ever get confirmation on the origin of these particles? Yes, it ceratinly appears to be a micrometeorite! It even superficially resembles a tektite: origins of these things are hotly debated by some experts and collectors–either terrestrial or lunar sources are possible–or both!–but is probably not since tektites contain no magnetic meteoritic material. The late H.H. Nininger and NASA’s John O’Keefe and Dean Chapman believed they came from the Moon. (Some of the encrusted orange-colored material on your sample resembles soil found on some Southeast Asian tektites.) But you’d have to contact a meteoriticist. The Smithsonian Institution may be helpful. FYI: A good place to search for micros is inside house rain gutters. I have found a few over the years. The University of Arizona has an excellent collection of meteorites and they should be able to help.